Since the 1960s, a significant effort has been underway to program computers to "see" the human face-to develop automated systems for identifying faces and distinguishing them from one another-commonly known as Facial Recognition Technology. While computer scientists are developing FRT in order to design more intelligent and interactive machines, businesses and states agencies view the technology as uniquely suited for "smart" surveillance-systems that automate the labor of monitoring in order to increase their efficacy and spread their reach. Tracking this technological pursuit, Our Biometric Future identifies FRT as a prime example of the failed technocratic approach to governance, where new technologies are pursued as shortsighted solutions to complex social problems. Culling news stories, press releases, policy statements, PR kits and other materials, Kelly Gates provides evidence that, instead of providing more security for more people, the pursuit of FRT is being driven by the priorities of corporations, law enforcement and state security agencies, all convinced of the technology's necessity and unhindered by its complicated and potentially destructive social consequences. By focusing on the politics of developing and deploying these technologies, Our Biometric Future argues not for the inevitability of a particular technological future, but for its profound contingency and contestability. 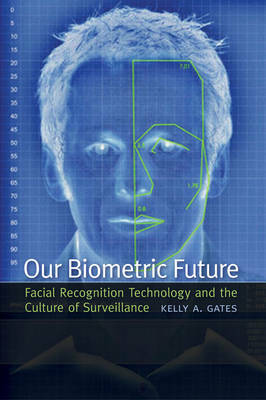 "Gates deftly explores the cultural work performed by facial recognition technologies, and in so doing demonstrates considerable skill in the critical analysis of emergent technologies. This book represents a significant contribution to our understanding about the ongoing elaboration of surveillance society throughout the globe." "A groundbreaking study. Our Biometric Future considers facial recognition technology through its wide range of political entanglements, such as post-9/11 security measures, the management of urban populations in commercial districts, and self-representation in online social networking sites. Across these contexts, Gates shows how facial recognition's political effects have developed in spite of the fact that the technology does not actually work very well. Written with style and wit, Our Biometric Future will resonate with readers in cultural studies, new media, science and technology studies, and anyone interested in surveillance, privacy and security in contemporary life."